This training system for process control represents a fully functional process control system. It consists of four individual systems: process module, control console, fault simulator and service module. 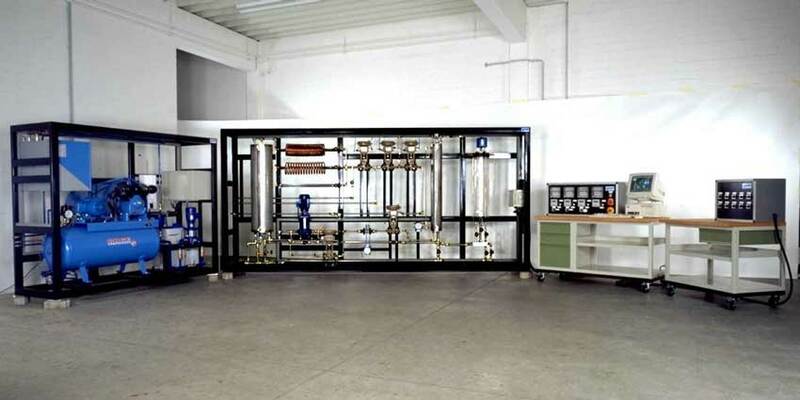 The actual process module contains the devices and loops for liquid-level, flow rate, temperature and pressure control with all necessary equipment, tanks and vessels, pipes and delay coils, various sensors and pneumatically actuated valves. The system is laid out in a way to represent a realistic part of a plant also found in heavy industry. The control console is equipped with four digital universal industrial controllers and four three-channel chart recorders. The controllers can configured independently as required and can be operated both individually and simultaneously. They all have serial interfaces permitting parameters to be set from a PC and facilitating interfacing with a process control system. The separate console for the fault simulation unit is used to study ten different typical system faults, e.g. sensor failure or cable break. These are activated using switches. Their effect on the system behaviour of the system can then be investigated. The service module provides compressed air, hot and cold water for the process module. A process communication system facilitates the central control and monitoring of the system.